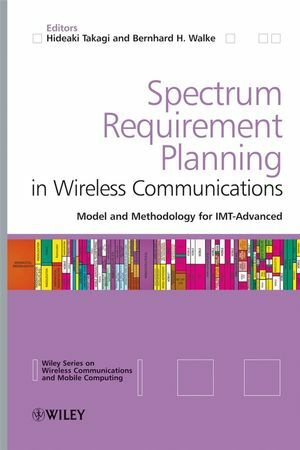 Spectrum Requirement Planning in Wireless Communications: Model and Methodology for IMT-Advanced is a self-contained “handbook” of the models and methodologies used for the spectrum requirement calculation for IMT-Advanced systems, as well as for the predecessor IMT-2000 systems. The reader will learn how the spectrum requirement is calculated for real systems that prevail worldwide. The book also provides the basis on which to develop advanced methodologies for yet future systems, as the spectrum regulation will continue in the future. This book serves as an invaluable guide to engineers in mobile phone companies, system design engineers, operator system engineers and other specialists dealing with mobile system planning and development. It is also of great interest to researchers and graduate students in the fields of applied probability theory, operations research, telecommunications, and mobile networks engineering. Hideaki Takagi, Tsukuba, Japan is a Professor in the School of Systems and Information Engineering and Chair of the Master's Program in Business Administration and Public Policy at the University of Tsukuba. He is the author of research monographs Analysis of Polling Systems (The MIT Press, 1986), and Queueing Analysis: A Foundation of Performance Evaluation, Volumes 1-3 (Elsevier, 1991-1993). He has published over 70 papers in refereed journals. He is IEEE Fellow (1996) and IFIP Silver Core Holder (2001). Bernhard H Walke, Aachen, Germany is the Chair for Communication Networks at Aachen University (RWTH), Germany since 13 years. He has published more than 110 reviewed conference papers, 25 journal papers and seven textbooks on the architecture, traffic performance evaluation, and design of future communication systems. He has been a board member of ITG/VDE and is Senior Member of IEEE. 1 Introduction (Bernhard H. Walke and Hitoshi Yoshino). 2 Utilization of Radio Frequencies (Hitoshi Yoshino, Naoto Matoba, Pekka Ojanen and Bernhard H. Walke). 2.2 Spectrum Management by ITU. 3 Spectrum Requirement Calculation for IMT-2000 (Hideaki Takagi). 3.4 Sequel to the Story. 4 Spectrum Requirement Calculation for IMT-Advanced (Marja Matinmikko, J¨org Huschke, Tim Irnich, Naoto Matoba, Jussi Ojala, Pekka Ojanen, Hideaki Takagi, Bernhard H. Walke and Hitoshi Yoshino). 4.2 Models and Input Parameters. 4.4 Summary of Methodology for IMT-Advanced. 5 Calculation Tool Package (Marja Matinmikko, Jörg Huschke and Jussi Ojala). 5.1 Description and Use of Software Tool. 5.2 Front Sheet of Software Tool. 5.3 Inputs to Software Tool. 5.5 Outputs from Software Tool. 6 Market Data (Marja Matinmikko and Mitsuhiro Azuma). 6.1 Collection of Market Data. 6.2 Use of Market Parameters in the Methodology. 6.4 Example Input Market Parameter Value Set. 7 Radio-Related Input Parameters (Marja Matinmikko, Pekka Ojanen and Jussi Ojala). 7.2 Use of Radio Parameters in the Methodology. 7.3 Example Input Radio Parameter Value Set. 8 Numerical Examples (Tim Irnich, Marja Matinmikko, Jussi Ojala and Bernhard H. Walke). 8.1 Packet Size Statistics and QoS Requirements. 8.2 Traffic Demand Derived from Market Data. 8.4 Offered Traffic per RAT Group and Radio Environment. 9 Capacity Dimensioning to Meet Delay Percentile Requirements (Tim Irnich and Bernhard H. Walke). 9.3 Waiting Time Distribution in M/G/1 Queues. 9.5 Accuracy of Gamma and H2 Approximations. 9.6 Impact of Percentile Requirements on System Capacity. 10 Epilog: Result ofWRC-07 (Hitoshi Yoshino). Appendix A Derivation of Formulas by Queueing Theory (Hideaki Takagi). A.1 Erlang-B Formula for a Loss System. A.2 Erlang-C Formula for a Delay System. A.3.1 Two classes of calls with single server occupation. A.3.2 Several classes of calls with multiple server occupation. A.4 M/G/1 Nonpreemptive Priority Queue. Appendix B Example Market Study Parameter Values. Appendix C List of Acronyms and Symbols. Appendix D ITU-R Documents and Web Sites.